On the Pacific side of the peninsula, either the Coronado Islands are being ignored or the fishing is slow. Inshore at Ensenada and San Quintin, there are limits of both yellowtail and calico with the possibility of yellowfin tuna a few miles farther offshore. Down below, Cedros, Mag Bay and farther down, the Finger Bank are all on fire! 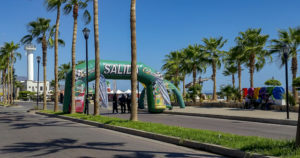 Although there are few anglers, from Bahia de Los Angeles to Loreto, reports would indicate those finding the right place at the right time are being rewarded with catches and the stories to go with them. La Paz and East Cape are still talking tuna in a big way, while roosterfish, dorado and wahoo remain a possibility. 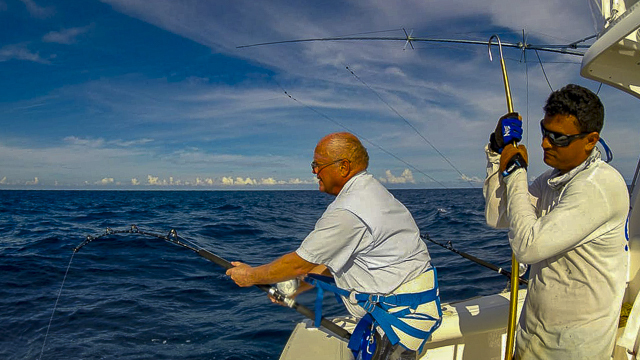 On the billfish front the few blacks and blues being taken would indicate that their fall arrival began early. Speaking of early/late or something, the striper bite — usually occurring in January-March — is going off at the Finger Bank 50 miles or so above Land’s End on the Pacific side. The area had some good bonito and calico bass fishing for the few boats fishing there. Recently there has been some radio chatter of yellowtail along the weather side of North Island and off Pukey Point. The south end of South Island and the Lighthouse area down to the 5 Minute Kelp area is going to be the primary zone to look for bluefin. Fly-lined or slow-trolled sardines on 20-pound fluoro fished way back away from the boat will be your best bet for these 15- to 25-pound tuna. Haven’t heard much in the way of yellowtail from the few boats that have looked at the islands this week. 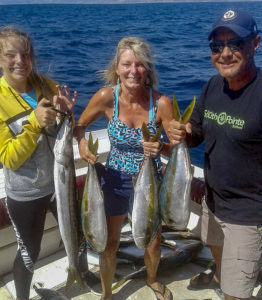 There are still some kelps holding dorado on the Nine Mile Bank and in the deep water just outside, along with skipjack puddlers and blind jig strikes, plus there are some good numbers of skipjack on the North end, and you may also stumble across porpoise holding yellowfin, too. There were one or two good schools of nicer-grade, 15- to 30-pound yellowfin in the area and they wanted to bite! Several boats were in the area and loaded up. The bite was kicked off by a skipjack jig strike and turned into a wide-open yellowfin bite with a little chumming. Yellowfin fishing was once again a little “hit or miss” to start the day, but there are plenty of fish around, and by the afternoon many boats had pieced together decent scores. Fished the 6, 240 and caught 8 yellowtail, 1 yellowfin tuna, and tons of bonito. Most fish were taken on trolled Rapalas, feathers, and cedar plugs. 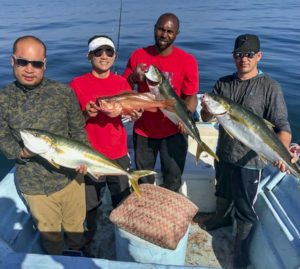 The yellowtail were mostly small with fish averaging 4 to 6-pounds. One fish weighed around 14-pounds. Bonito were anywhere from 5 to 10-pounds. 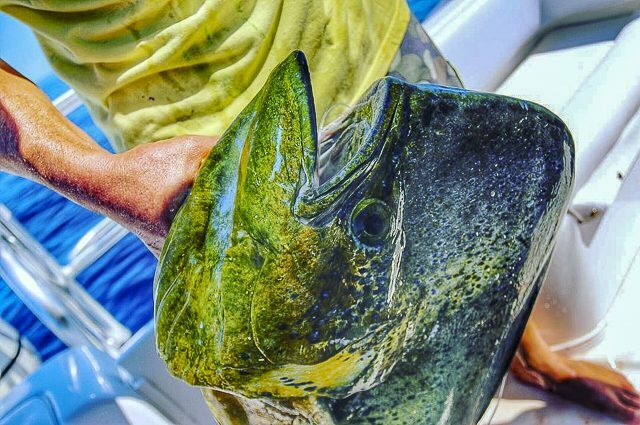 there are yellowfin, dorado and wahoo to be had for anglers. Lots of bigger yellows on the south end of Guardian Angel Island, down deep. Not much inside the bay. No surface action. Saw a few dorado under the boat but didn’t hear of any caught. Sierra and toro have entered the fishing picture with more people trolling greater varieties of lures. The toro have been here for a couple of months but only the scuba trips have been encountering them. The smaller versions of dorado are still in the mix along with an assortment of roosterfish. The days are getting shorter as we get midway into September and the temperatures have started to slide down, slightly. The months of Oct. thru Dec. are the best times to fly fish Mag Bay. We have been doing fly fishing trips here in Mag for over 20 years starting with Gary Graham who wrote a book about fly fishing Mag. Gary has gone on to writing now and doesn’t guide anymore. Jeff DeBrown from the Reel Baja has our one of our boats booked for two months and if you are over here, you will probably run into him. We have a small hotel, the Whales Tale Inn, that’s nice if you need a place to stay and is very reasonable. Mike Reiser fishes over here a lot and is also very good. You will have a good time. We have caught several marlin on the fly already and it looks to be another good year. Two areas have been producing limits of 10- to 40-pound fish, with a few taken around 70 pounds. They’re just one to two miles off Punta Pescadero. The tuna are being taken almost exclusively on chunk squid. Similarly, one to two miles off La Ribera, limits of yellowfin are biting mostly sardina. The large school has moved from Punta Colorado north to La Ribera over the course of the week. In a few words: It’s very good tuna fishing! The first wave of early fall anglers is arriving, still only moderate numbers, but more people than we have seen in recent weeks. This week the weather has been calm; last week had a few isolated thundershowers that did bring some heavy rainfall in some areas. We do not presently see storms on the forecast, but tropical systems can develop rapidly this time of year; we will be watching closely. All is quiet in the Eastern Pacific at this time. 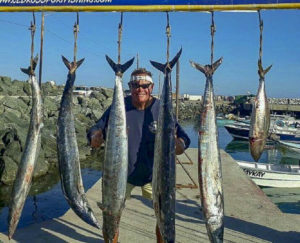 Winds were very light this week, swells were moderate, supplies of sardina were plentiful and anglers were enjoying great ocean conditions; days were still very warm, and humidity is high as it normally is during the month of September. Anglers were using both sardina and strips of squid with some chihuil being caught for bait as well. 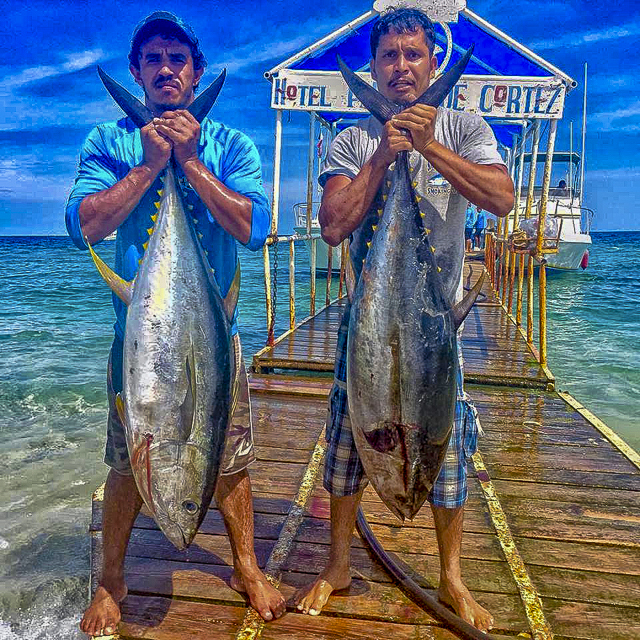 Yellowfin tuna were found from the Gordo Banks to Iman and San Luis. Smaller football tuna mainly being found on the Gordo Banks, though on Iman and San Luis the yellowfin tuna were averaging 50 to 70-pounds. While finicky at times, lots of patience and persistence are needed as the best method is drift fishing while chumming, and you deal with lots of triggerfish and needlefish stealing baits. At times tuna can be seen boiling and jumping out of the water, but they proved to have lock jaw. However, they would go on the bite sporadically — some days early, and sometimes much later in the day. Anglers were doing well to land one, two, or three of these quality tuna. Only a few dorado are being found and most of these were under ten pounds. Most of these were a bit closer to shore than where the tuna were schooling. Wahoo were very few and far between, though every few days we heard about someone catching one. Only a few small roosterfish were found close to shore. We did not see any consistent bottom fishing action, though a couple of nice cabrilla in the 40- to 50-pound class were accounted for along with a handful of red snapper, bonito and a few dogtooth snapper in the 20- to 30-pound class. Numbers at a glance: Billfish 38%, tuna 20%, dorado 53%, other species 4%. Rebecca made its way out to the Finger Banks to try its luck at catching some marlin. 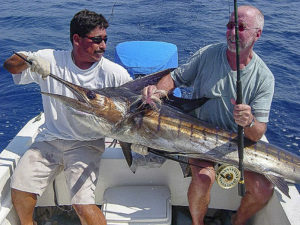 They found it, catching and releasing 9 striped marlin, which hit on caballito bait. 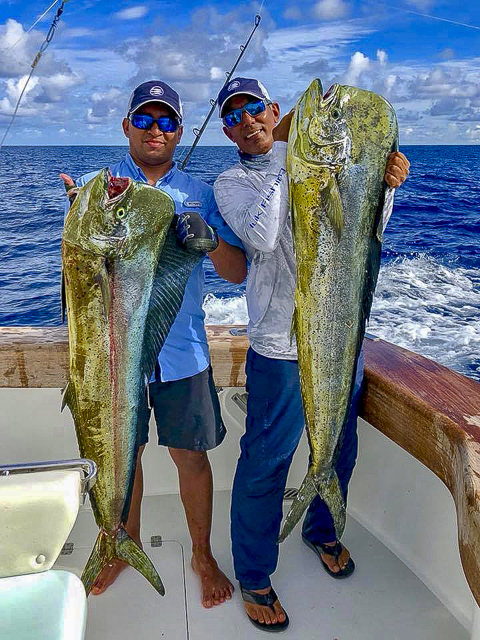 The 12th and 13th, they found luck with more dorado on the Ruthless and some football-sized tunas on the Pisces 31-foot La Brisa on their last day. 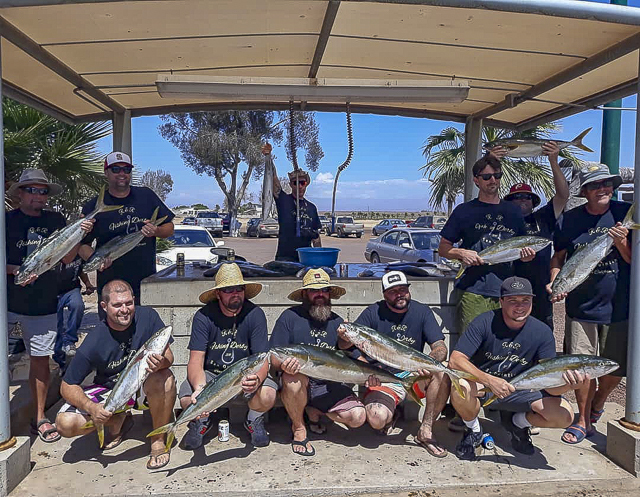 La Brisa also released 9 striped marlin at the Finger Banks on the 10th, using caballito bait as well, and anglers Tim and Paul Gilberry also landed some tuna — 9 yellowfin between 12 and 15-pounds each. Pisces 42-foot Yahoo did great releasing 10 striped marlin also at the Finger Bank on caballito bait. Anglers Andrew Chalson, Brett Hawlay and Thomas Ronchetti from Georgia did an awesome job landing these and 4 yellowfin tuna as well. WEATHER CONDITIONS: Rain Sept. 9 and 10, partially cloudy others — Ending the week with calmer seas. Temps are getting into the mid-80s with some west winds and clear skies. We might not get a storm this year. Good numbers of marlin in close with a few small blues starting to show. A few yellowtail have been caught. The dorado are still a ways out, but I think we will see a decent return. Fished the Aleta with Mr. Joe Ferguson and friends. Fishing was great, lots of fun for everyone!! Albert Battoo is in Quepos, Costa Rica.